Nothing can compare to learning from nature.Sitting in the solitude of an English garden on a warm summers day listening to birdsong and placing your focus on flowers searching for colour variations and the play of light on each petal is so relaxing and very rewarding. I am aware that the foxgloves in my garden are now getting past their best from the beauty of the last few weeks where they have put on such a glorious display. Towering in tall spikes above the other smaller plants they have created such regal impact especially when in full sun. And so I sat quietly working on two large pieces of paper allowing colour to fall where it would in my first wash but at the same time carefully placing drops of pigment to encourage the bell forms. Nothing can top watching a shot of Cadmiun Orange allowed to just burst onto a wet wash. As it hits the paper it appears to bossily push the other pigments out of the way. 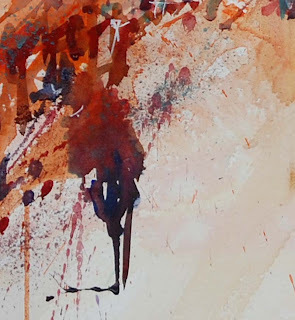 I can almost see the transparent Alizarin Crimson making way for the heavy opaque that takes over with force at first always looking frightening when wet until it drys to a softer glowing shade of orange. I will confess, I am thrilled with this first wash. My "ghosts" as I call them of the individual flowers are already exciting. I need to do very little to complete this piece and it will be a favourite because of how it is flowing so beautifully in its development. Foxglove bells appearing in a beautifully exciting first wash. I mentioned I started two paintings at the same time. The one above is intended to be louder in colour , more vibrant and more exciting. The second seen below is intended to capture the more delicate side of this flower. A subtle pink wash with hints of the yellow buds to create a quieter result which I can relax with whilst escaping the heady passion of the first painting. 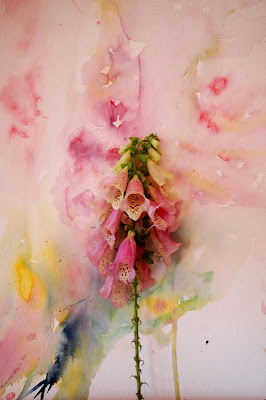 Second Foxglove painting in delicate pink from heavily diluted Alizarin Crimson. 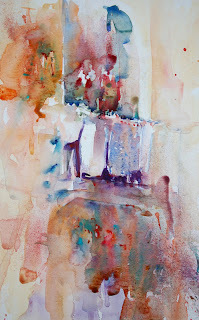 Tip: When we paint from life our senses are more receptive to possibilities than when we work from photographs. We see colour in its most truest form, we see shape as it really is minus distortion from a flat image and we feel life in the subject. All this knowledge then transfers easily to our painting. I can only paint from photographs successfully if I have genuinely seen the subject, taken the photograph myself or have painted from life many times in between doing so. The images here reflect the difference in colour from painting in sunlight in my garden. The moral of this story is to paint from life as much as possible! The speed of my brushstrokes played a huge part in the final touches to "Catching Up" my latest horse racing scene which will be in a London Gallery during an exhibition. I will share dates and details of the event at a later time. 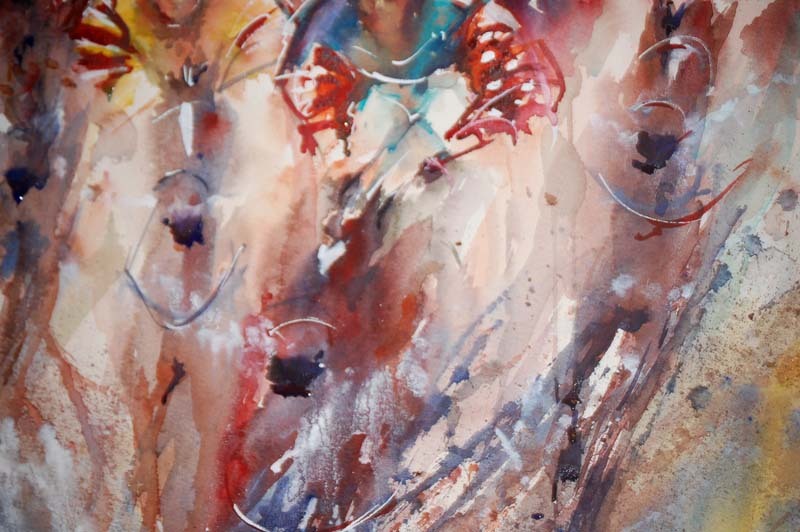 For now I am having such a fantastic time painting favourite subjects, looking at new ways to capture them and exploring possibilities to achieve even more movement and life in each piece. I leave for Norway soon for my watercolour workshops there and return to UK for my next "Watercolours With Life" workshops here which are fully booked. Apart from working on my next book I also have a very exciting exhibition coming up which will include my latest work . Life is wonderful and my paintings I hope reflect the joy I feel when holding my brush. Our moods effect what flows into our work along with our personalities. 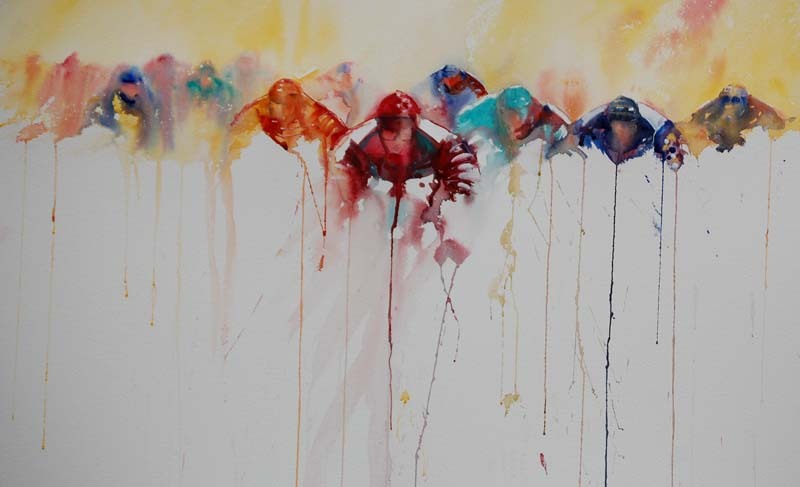 As a restless spirit who finds it hard to sit still for a long time or work on one painting at a time I fully understand why horse racing scenes appeal to me. They are full of energy, excitement, movement and life. Jockey d'une grande scène dans cette peinture. Si vous regardez étroitement d'autres cavaliers sont à l'arrière-plan ici, juste des conseils d'apparaître de visages. Il était si beau pour se réunir et parler à un ami hier qui avait été sur mes ateliers il y a quelques années et écouter la façon dont elles ont observé mon voyage au cours des dernières années. Mon modèle a changé pendant que ma carrière de confiance et d'art s'est développée. Je le vois aussi. J'ai toujours admiré les grands maîtres dans l,aquarelle qui au cours des années ont affecté qui je suis, comment je veux peindre et où je veux être. Grands noms dans l'aquarelle comme Jean Louis Morelle, Madame Blanche Odin, John Singer Sargent, Ewa Kapinska. Ces artistes ont placé un désir ardent dans moi de s'améliorer à leur niveau. Une passion qui ne peut pas être ignorée. Je veux plus de mon travail que juste pour une scène qui peut être identifiée. Je veux l'impossible. Moi veulent un sentiment de la vie dans chaque traçage, l'émotion derrière chaque visage, le mouvement derrière chaque scène de emballage et les animaux qui regardent comme s'ils pourraient être pris ou frottés. Et je veux de nouvelles techniques. J'ai le treid chaque simple qui existe et chaque idée que j'entends au sujet de mais suis venu à un point où masquant le fuild, sel et m'accroche film, tout le "; gimmicks" ; ne me captivez maintenant plus. Je veux plus. Je veux que mes aquarelles aient la texture et l'excitation seulement de l'interaction de colorant, de la couleur et de mes placements de brosse. Il y a des manières de duper l'oeil dans croire une scène est vivant et sautant outre du papier à vous. Travailler à un deuxième livre est vraiment la plus grandes poussée et raison de motivation de moi d'examiner plus loin l'exploration passionnante. Je sais que cela le partage de mes nouveaux résultats et voyage dans le watercolour apportera au plaisir et à la joie à d'autres qui comme moi amour tenant une brosse et fonctionnant dans ce milieu incroyable. Un nouveau modèle émerge avec un mélange de et nouveau et ceci est vraiment un moment très passionnant dans ma vie. Je ne peux pas attendre pour commencer à peindre aujourd'hui ! 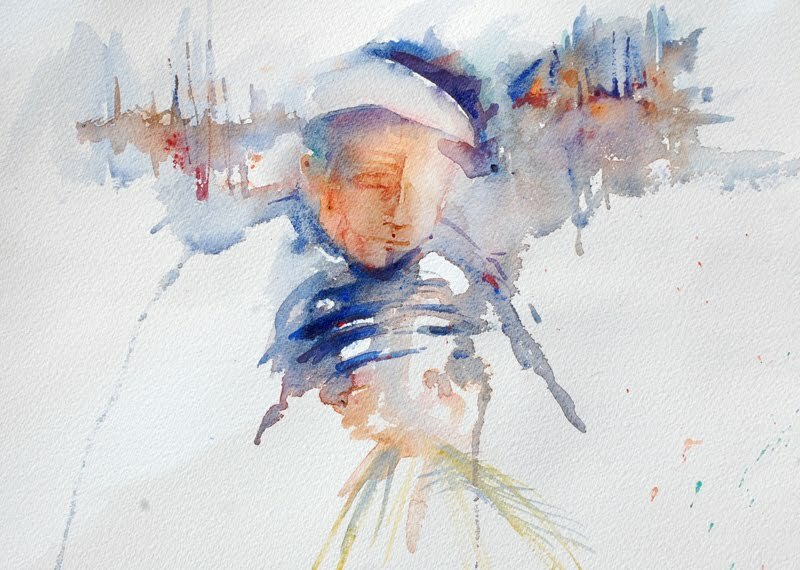 Jockey from a large scene in a latest painting. If you look closely other riders are in the background here, just hints of faces appearing. It was so lovely to meet and talk to a friend yesterday who had been on my workshops a few years ago and listen to how they have watched my journey over the last few years. My style has changed as my confidence and art career has grown. I see it too. 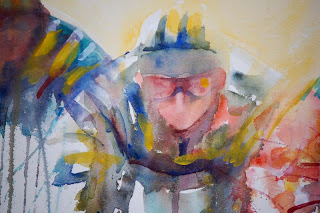 I have always admired great masters in watercolour who over the years have affected who I am, how I want to paint and where I want to be.Great names in watercolour such as Jean Louis Morelle, Madame Blanche Odin, John Singer Sargent,Ewa Kapinska. These artists have placed a longing in me to improve to their level. A passion that cannot be ignored. I want more from my work than just for a scene that can be recognised. I want the impossible. 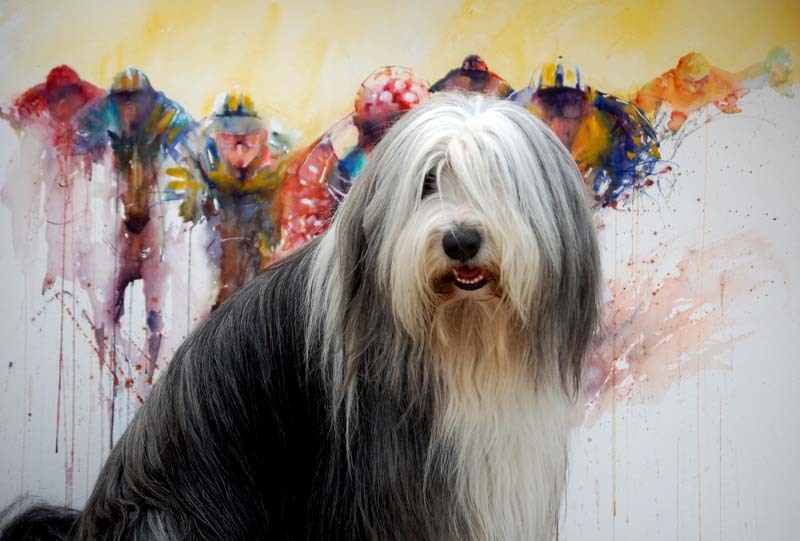 I want a feeling of life in every brushstroke, emotion behind each face, movement behind each racing scene and animals that look as though they could be picked up or stroked. And I want new techniques. I have treid every single one that exists and every idea I hear about but have come to a point where masking fuild, salt and cling film,all the "gimmicks" now no longer thrill me. I want more. 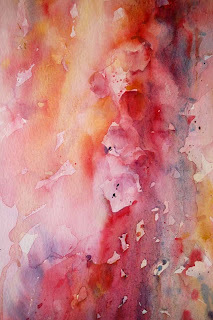 I want my watercolours to have texture and excitement purely from pigment interaction, colour and my brush placements. There are ways to trick the eye into believing a scene is alive and jumping off the paper at you. Working on a second book really is the biggest motivational boost and reason for me to look further into exciting exploration. 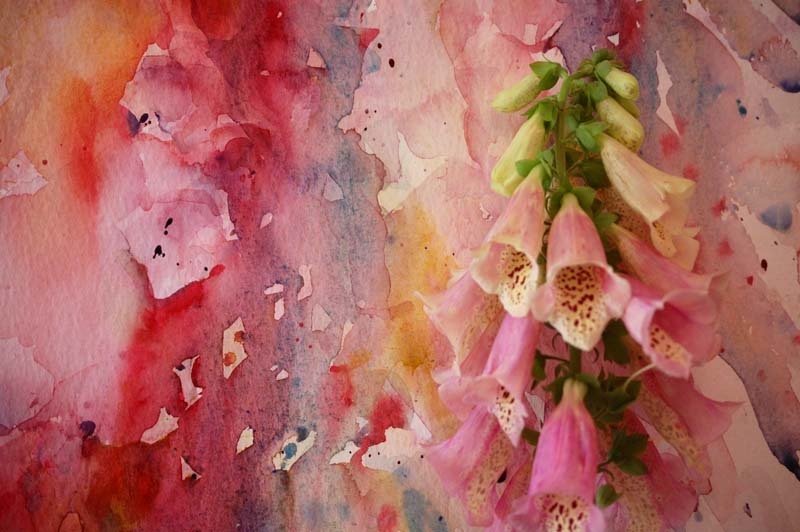 I know that sharing my new findings and journey in watercolour will bring pleasure and joy to others who like me love holding a brush and working in this incredible medium. A new style is emerging with a blend of old and new and this really is a very exciting moment in my life. I cannot wait to start painting today! 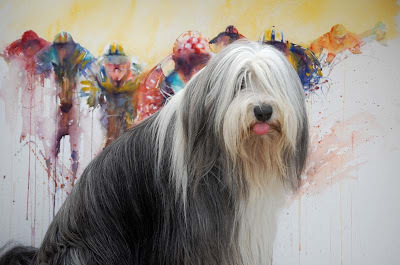 Bailey, my young Bearded Collie letting me know he isn't impressed with this painting! I thought it might be interesting to share how I take images of my work. I often stop at stages to record the development of a painting. I also take images of finished paintings. I usually take these images in natural light standing the largest paintings in my garden studying them to see if any further work would make a difference. It is amazing how one small extra brush stroke can either take a painting to an effect of added excitement or drama whilst another could completely ruin the piece altogether. Knowing when to stop and put down that brush is a skill that takes time to master. But taking photographs in the garden or of large paintings holds it own risks. I have two cats that wander in front of my lens every single I pick it a camera and two dogs that race to be in each shot at every opportunity. Yesterday Bailey, my youngest Bearded Collie decided to get in on the act too. As you can see from the image above he definitely isn't too keen on my latest horse racing scene! Maybe he felt it just needed something larger in the foreground of the composition! Bailey fitting into the composition! I am receiving many wonderful requests for workshops and demonstrations. Although my Autumn 2010 workshops and are mostly fully booked I will be adding new dates for my Spring 2011 sessions to my web site and here on my blog later this year. As I am working on my second book and painting for exhibitions these will be limited in number. As I know everyone coming to my workshops really enjoys the motivational experience I will do my best to try to have enough dates available for as many artists to come as possible. 31st August "Watercolours With Life" Workshop in Hampshire U.K.
2nd October Basingstoke Art Society Watercolour Demonstration, U.K. Original watercolours can be seen in galleries in Hampshire,Dorset and London. Section from a full sheet painting. I have been asked for very large paintings and so this week has found me standing in front of massive sheets of white paper and exploring the possibilities of huge racing scenes. As one colour has flowed excitingly into another so many wonderful ideas have materialized for my next book. Ideas covering pigment interaction and techniques that can easily be followed to create a variety of endless subjects and compositions. So far I have four large horse racing scenes in my studio. All at various stages. Each morning walking into this room and deciding which to work on next, what colour or brushstrokes to add have really kept my imagination very much alive. If I am working on a series I often start the whole collection at the same time so that my palette matches each but ensuring they vary at the same time. Here is the first large painting and everyone who has seen it loves it just like this with no more detail added. A close up of one jockey from the painting above in a completely different technique to my usual working with opaques more obviously. But the jockey below is definitely my favourite guy so far Faces and expressions say so much in this line of work so I am thoroughly enjoying the hints of portraits in a few sections. Tip: During my workshops I am often asked how I choose colour for my subjects and how do I know where to put what for the best effect. My answer is knowledge comes with practise. It also helps if you really love what you are doing no matter what it is. I adore colour in all forms of my life. My clothes, my garden, my home. It's only natural my watercolours are also going to be vibrantly interesting and full of life. So start by looking at how much colour is in your life when you are not painting. This tip really does work and makes a huge difference to your results! Horses racing. The aim of this painting is to capture movement and life via energetic brushstrokes and wise placement of colour. Yesterday I couldn't settle because of the situation with our elderly dog Taffy. Whilst he slept on and off during the day I painted but at this time the thought of painting flowers or a still life really didn't appeal to me. I was restless and finding it very hard to sit still. And so I found myself stood in front of a large board and a full sheet of white paper imagining what would work best on it. 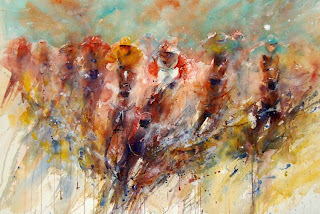 I chose horse racing as a subject and allowed my imagination to place the subjects in my composition and these begged for certain colours, brushstrokes and many sections left to the viewers imagination. Normally when I work on horse racing scenes my focus is on the jockeys but this time I became totally engrossed with the horses. I didn't want to paint them in fine detail as for me just the suggestion they are there is enough. I am working on a series for a galleries at the moment. I rarely say I like a painting I have completed but the development of this one is quite special in that I have felt I am crossing yet another step in experimentation as new ideas have come into play with my techniques. My aim at catching a sense of life in my work is beginning to take a new direction and it really is very exciting. Today is a new day and a new piece of white paper is calling me. Reclaiming a water bottle that Taffy had mischievously "stolen" for attention while I was painting in the grounds. Many artists have four legged companions that keep them company while they work. I often hear friends talking of their cats walking through their palettes or trying to drink from their water containers. I have two cats and two dogs. Biscuit and Buster came into our lives as kittens at almost the same time as our youngest Bearded Collie Bailey. My oldest pet Taffy came into my life over thirteen years ago whilst I was living in England but we moved to Dubai the year he arrived where he adapted to early morning walks on the beach to keep cool. 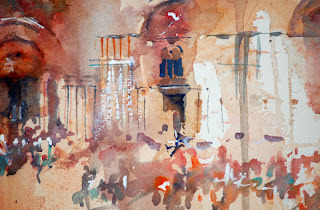 I taught watercolour workshops at the Dubai International Art Centre and he often appeared in my paintings. From Dubai I moved to France where Taffy met French artists and next he appeared to learn to bark in Chinese as I returned to Hong Kong where my Chinese brushwork improved. Following a time in Belgium he then returned to UK and his "normal" barking which is either English or Welsh. 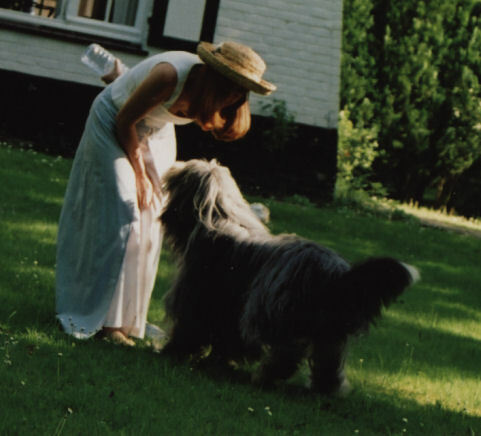 The amazing thing about Taffy is that wherever he has lived he has met artists and students of mine all over the world who adore him finding him a huge bear of a dog with a gentle spirit and heart of gold. He is loved by so many. To me he is invaluable as he nudges my arm when I have been painting for too long. In Taffys eyes an hour without attention is far too long so a push on my left arm , never my right as he knows I am right handed, will often lead to a hug, kind words or a stroll around the garden. Taffy taught me to walk away from my work, take breaks and love each stage as a painting develops.Without him I would have raced to complete a piece. Because of him I have found that taking time out to enjoy the simple things in life is important as being continually locked away in a studio working intensively can lead to dull results. Thinking about a painting whilst moving away from it for a time really leads the brain to seeing possible pitfalls ahead of time,alternatives in colour additions or even chnages in the compositions. My gentle friend is struggling this week. He has won so many battles with his health this year and my heart is sinking as I realise this is one battle he may not win. He is weak and although his tail gently thumps when I stroke him I know it really is a time when I need to treasure each moment with him.Time we have left. This is a very difficult week and my brushstrokes right now hold no distraction. My artists "friend" needs me. Some time ago I made a comment that I would love to see new born lambs and have the chance to hold them. A friend told me about an amazing farm that holds open days throughout the year where visitors can touch and meet a huge variety of farm animals. I went along that Spring but wasn't prepared for what I was about to see. As a keen photographer I caught many images that later became firm favourites in my workshops for everyone to share and paint. My cockerels most of all led me into an area of my art life that again was not expected.With them I was accepted into so many exhibitions including the SWA,Society of Women Artists where I was awarded the Anthony J Lester Art Critic awardin 2009. Since then my cockerels in watercolour have become collectible and are in homes all over the world. All thanks to an incredible farm that does so much for the community. Sadly Millers Ark is now closing and will be missed by so many. If you would like to visit for one of the very last open days in its present location please look at the following link. Roke Farm has brought colour to so many lives. Roke Farm, Near, Odiham in Hampshire. "We never fully realise how wonderful something is until we are about to lose it"
A sense of movement, life and emotion. Sometimes I return to favourite subjects that I have painted previously. This child is a young lad I saw when I was in Hong Kong visiting one of the islands. From a fish restaurant nearby I sat and watched as he found treasure after treasure.Shells, small pebbles and items that many adults would simply pass by. To this small boy each was something incredible worth taking the time to touch, study and enjoy. We grow and as our lives become busy we often miss so much. It is the same whilst painting in watercolour. We can miss the small wonders of a painting as it develops purely by being in such a race to get to the finished result. 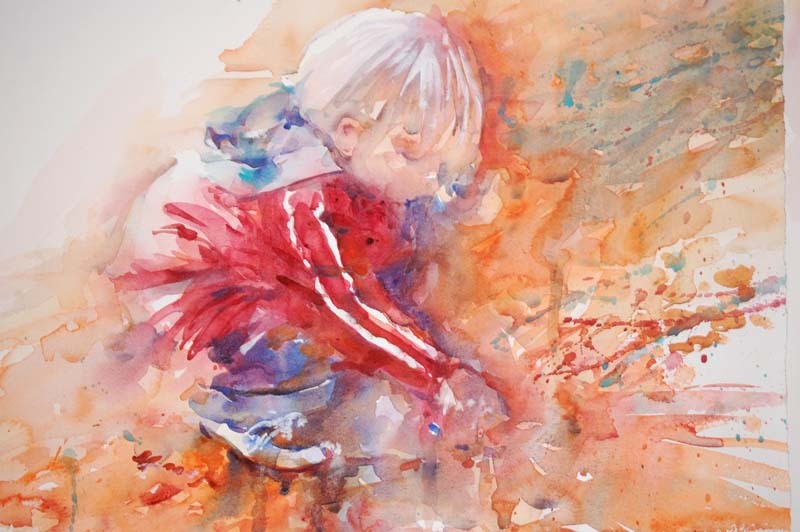 For me every brushstroke brings the joy felt by a child such as this on the beach. Each mark on paper is a treasure that leads to another and every stage leads me to somewhere else that is just as fantastic. How we learn from the innocence of a child in so many ways. I am working on a series of large paintings including full sheet and larger for galleries and exhibitions. It is quite thrilling placing colour across large expanses of white paper. The freedom of space allows room for expressive brushstrokes and also detail on favourite sections. The statues were a sheer joy to play with in abstract form. 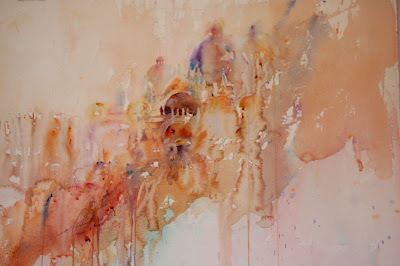 But most of all I adored adding the abstract figurative work in the foreground. Bold colours almost making a statement of tourists stepping into yesteryear , making a difference to a scene that has been loved in history for so long. Hints of figures via bold abstract brush marks. I could paint this scene a million times and never tire of the endless possibilities for even more exciting results.I can completely understand why Venice is an artists favourite and why so many paintings have been created inspired by such incredible beauty. It is time to start a new piece and take all that I have loved from this piece into the next. I have that " buzz" that all artists feel when they are about to start something incredible. 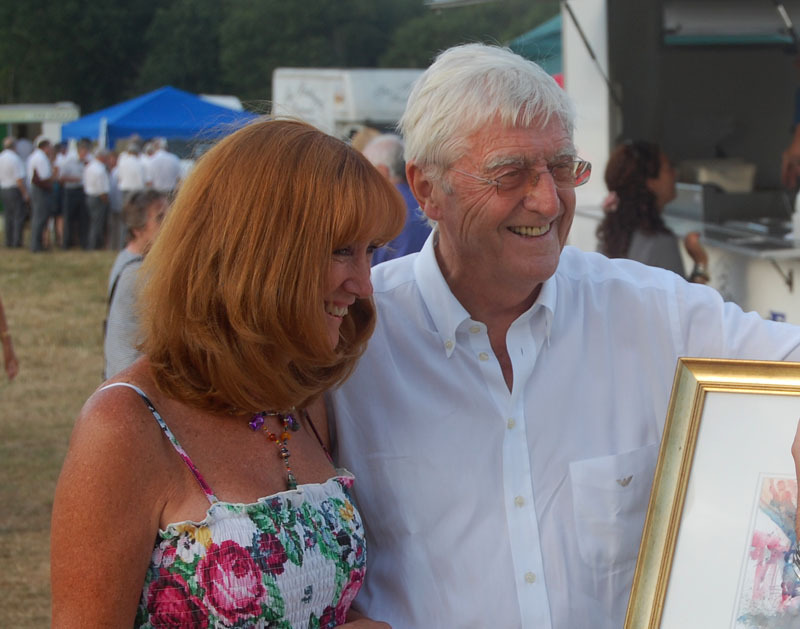 Earlier this year I was delighted to take on board the responsibility of the Farnham Arts Society Salvin Event and this led to my meeting Melanie Shepherd at the David Shepherd Wildlife Foundation head office to discuss the event which will take place in September. I was so impressed and inspired by this visit because the offices are small but the amazing passion held within the walls hits you as soon as you enter. Since then I have also met David at the Wildlife Artist of the Year 2010 exhibition where my work was amongst the finalists on show at the Mall Galleries in London. The Salvin Event this year will take place at Farnham Castle and it is a wonderful venue. Several meetings later at the castle and with posters and tickets now advertising the event it is time to jump in quickly if you would like to attend. Due to my full and crazy art life which seems to be getting busier by the second I have had to hand over the responsibility of organisation but I know this will be a very special and memorable evening. I listened to Davids speech at the Mall Galleries earlier this year and spoke to him during the evening. He is a true inspiration as an artist and for all he has achieved in his life. 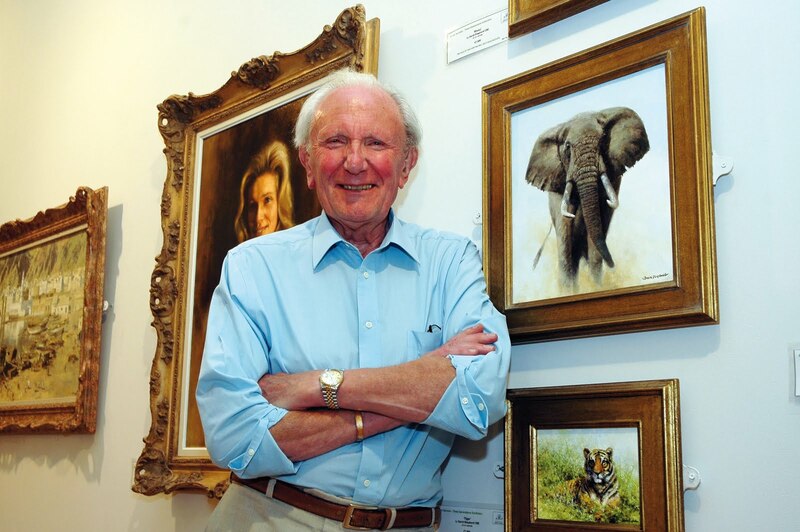 For details of an evening in a castle with one of the greatest wildlife artists please see Farnham Arts Society news page. Tickets are available at £15 which includes one glass of wine. All proceeds from the evening go towards DSWF. David Shepherd Wildlife Foundation. Another week coming to an end and my studio is a treasure trove full of exciting washes waiting to be completed and new paintings yet to be explored. I feel like a spoilt child because there is so much I want to capture in watercolour and not enough hours in the day to do so. I was fascinated listening to someone tell me recently that they couldn't possibly work in watercolour because learning how to use the medium is so complicated. They are an ardent cricket fan. When they tried to explain the ins and outs of the game I laughed. 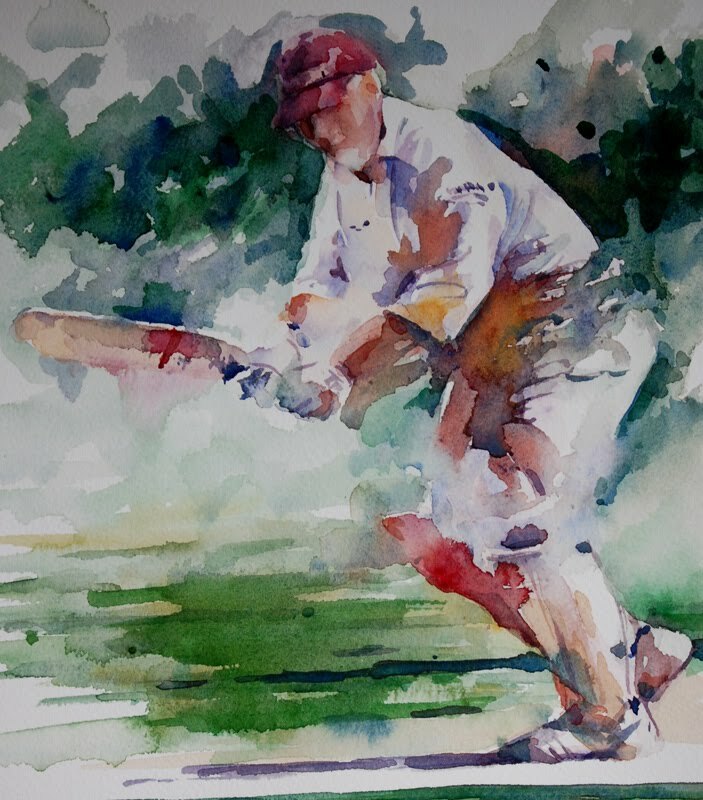 To be honest I think working in watercolour is far less complicated than understanding the game of cricket. But oh wow what a great subject the players make! Small Study in preparation for a larger painting. My studio at the moment is like a time machine where I can easily move from one country and time to another by the flick of a carefully placed brushstroke. I have scenes from Venice, fish markets with fishermen from all over the world. sheep in fields, dogs, flowers and portraits all spread in different browsers or on easels or even floor waiting for me to decide which I will work on today. I may start something completely new or work on a painting that was previously started. Working this way means I always without fail move towards a subject calling to my artists soul .I paint from my heart, selecting what I want and when I want which I believe shows in my results. But sometimes things just happen that take me totally by surprise. 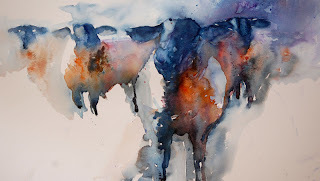 Yesterday I was painting colourful washes and loved one that was full of life with oranges and blues. It reminded me of a scene I had painted years ago and so I added a face or two,then I could imagine a camels head in the foreground. My time in Dubai came flooding back to me with vivid memories of days when I would watch groups of riders moving across the desert.What an amazing sight that was and I could never in a million years capture that feeling without having witnessed it myself. I have placed the small study by my desk so I can enjoy its colours and the memories it is bringing back to me and I am thinking of painting a large scene next. This study is far too tight and I am unhappy with certain brush detail so will work on a far better piece later. As a starting point for a new collection it really is turning me on though. What choice I have at my fingertips and how brilliant it is to be able to be anywhere in the world this way! There is a saying that when one door closes another one opens. In my life another three seem to open and all at exactly the same time! I have so many requests and decisions to make that my priority is time to paint first daily and everything else falls after that. Recently I was asked to make a DVD which will be out this autumn. In it are several demonstrations on techniques covered in my book " How to Paint Colour and Light in Watercolour". One is a very old tip for painting straight lines. Because I never use a preliminary sketch I don't have the necessary guidelines to lead my brush when working on architecture. Many of my landscapes and buildings include very old buildings where outer edges would hardly be seen as perfectly straight. In fact the odd uneven line often adds charm and an appearance of age. But there are times when I do want a straight line and I know some artists coming to my workshops do too as they may prefer a more exact painting with precise detail in sections. 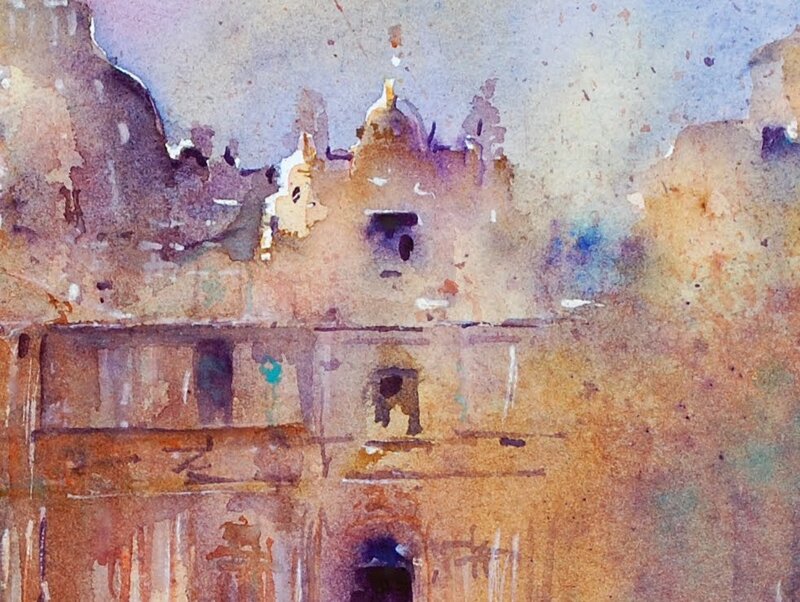 So how do you get the perfect straight line in a watercolour without using a ruler? Lay a piece of card with a straight edge on your paper and paint along the edge. Then very quickly work away from it with the same colour. Lift the card very carefully which I have demonstrated on my DVD and there you go. A straight line! By the way I rarely work with straight lines, I prefer the ones with character! Book Launch at the Mall Galleries in London, July 2010. The weeks leading up to my book launch at the Mall Galleries in London passed by so quickly. With all the excitement of being in such a prestigious venue for the book signing excitement filled the air in my studio every single time I thought about demonstrating there and meeting everyone who came to the gallery. Following the launch I then had a variety of art events so it is only now my feet are slightly touching the ground because I am facing even more exciting projects ahead which are keeping my artists soul positively flying. These I am certain I will be sharing in autumn but for now I am reading messages by email and facebook from those who already own my book and are working their way through it. I love all the positive comments but what is thrilling me most of all is that everyone seems to be taking the introduction and theory side very seriously. Enthusiastic decisions have been made to follow each and every exercise no matter how small it is. From mixing colour, playing with pigment and water building up to each of the demonstrations that lay at the end of the pages. I know the portrait included is quite complicated to imagine working on at first minus a preliminary sketch. 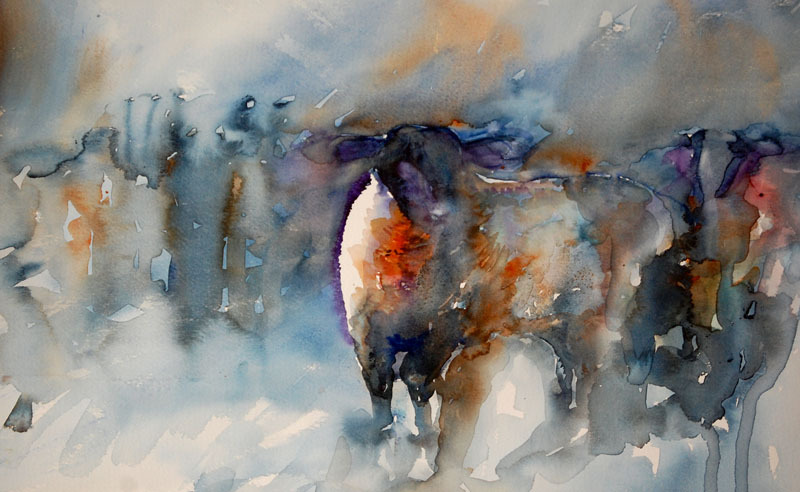 However in time learning to simply see a subject and how colour can build up each section will act as a guide to some really intriguing results. I am thrilled with the first studies that have been sent to me from reading my book and even more thrilled to hear how excited long established artists are from approaching a new way of painting. All the nerves now are disappearing about the launch and being "out there" but I have some amazing friends to thank. Those I just met and those who have been in my life for a very long time.Because your faith in how I work and who I am really has helped me in ways you may never fully understand. I am now working on my next book which I could not have ever been on a level to write without the experience of my first one under my artistic belt. I know where I am going and if you have worked through the simple exercises in book one you will be more than ready to move onwards to very new ideas in the next! 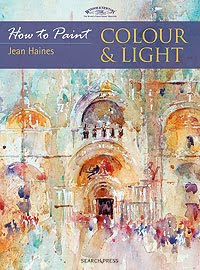 "How to Paint Colour and Light in Watercolour" is available online from Amazon or directly from my publishers, Search Press. As author of the month an interview is online via the Search Press web site. Yesterday with friends I was joking about a song with the lyrics " Monday is washing day". Over the years and all over the world women hang washing out to dry in so many ways. On lines stretching from palm tree to palm tree ob sandy beaches, in gardens large and small, from poles outside windows of high appartments.My Grandmother always thought of Monday as the day when she would do a weekly wash. All the bedding would be changed and hung out to dry in neat rows. It always seemed at that time that washing on any other day was completely unthinkable! Monday is a washing day to me but not in the same sense as in my Grandmothers home. It is a day of experimenting with exciting watercolour washes.To me this day is the start of a whole new week full of fresh, blank pieces of white paper all waiting to be transformed via brushstrokes carrying vibrant colour. 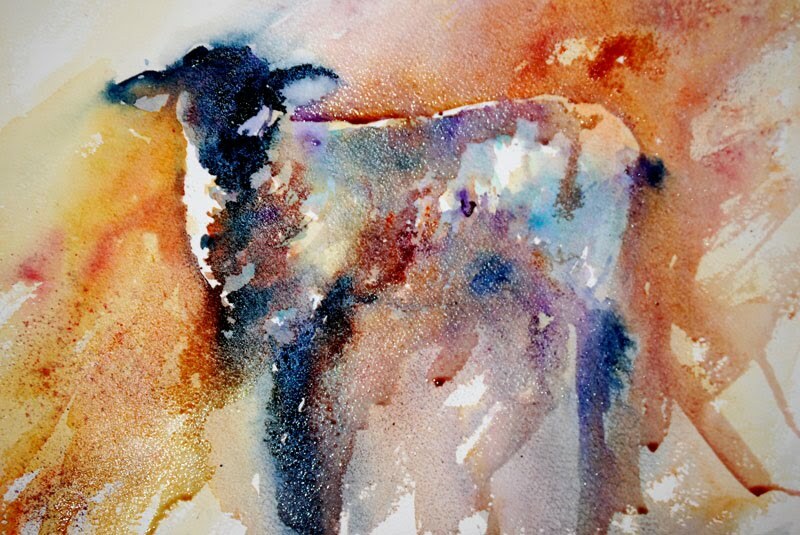 I am not quite sure where I am headed at the moment this week because I have a number of landscapes in my head waiting to be caught on paper, a whole new series of sheep paintings and on top of these ideas figures are appealing to me in French market scenes. I need forty eight hour days to capture all there is in my imagination in watercolour. But for now washing day is simply playing with colour and seeing what happens. Only then will I have an inkling of where this week is leading. And I know its going to be one of my best weeks yet! There is a wonderful word that to me sums up whether someone can paint or not. You may jump to the conclusion I am going to say that the word is talent but you would be wrong. Yes I am aware talent plays a part but I meet many artists of all levels who simply lack confidence. The only thing holding them back from achieving great things is belief. Belief in themselves, belief in their ability and belief in the feeling they could ever be a wonderful artist or even have the right to be so. As humans, we face so many facets of our lives with the conviction of knowing in advance we are unable to do them. Even though we haven't even tried or given it our all.. But when we cross a boundary in our minds to where we believe we actually can achieve our lives can change dramatically. To me it really is just a matter of believing you can paint and well that makes all the difference. The state of mind each time you pick up your brush plays a vital part to your results. .In my workshops I always ask everyone to imagine instead of saying "I can't" in their minds to please tell themselves " I can "paint. It does make a difference. Positive thinking really can enrich our lives in so many ways. And everyone around us for that matter as we attract positive energy. From childhood I have always been fascinated by colour. I have always adored art and found reasons to escape to create. Over the years I have studied under some very incredible masters in a variety of mediums. Everyone throughout my life has called me talented. I have often been told I have a gift on so many occasions and yet I have been very doubtful of my ability for such a long time. I demonstrate regularly and in my workshops everyone tells me how much I inspire them and how much they love my work. So why has it taken me so long to believe in myself and finally come to the conclusion I may just be a credible artist? Because it is far easier to run ourselves down than admit we might, just might actually be good at something. I was asked recently why my work had grown so much in the last twelve months.I have been asked so many times what has changed. My move to a new home and new surroundings? My book? Writing has really helped me develop. I taught myself more in the process of turning into an author than I have learned over all the years I have been travelling and studying under some very amazing artists. I studied my own style closely. I learned how I think and "tick". But that isn't what has helped me most of all. The truth is I have changed.. I now believe I may be able to paint after all. I may be able to reach my goal and dreams. I also wisely know I need to learn far more to grow to the level where I feel I want to be. I am not there yet. I may never get there because whenever I get to where I think I want to be there is always somewhere else I want to go! Another mountain to climb, a new adventure, project or possibility. Will I ever be a great artist? Maybe not in some eyes and maybe yes in others. This is not important though. What matters most is that I am loving every second of my journey and helping other artists on theirs. The fact so many wonderful people have believed in me and still do is helping me grow far more than anything else. Belief. How important is that word? That small insignifcant word that can make such a huge impact on everything we do. So to everyone who is following my blog, sending me emails, reading my book, meeting me in workshops, wonderful friends thank you all so much for helping me take each step in this fantastic adventure of being an artist in watercolour.Wherever I am heading I know I have support along the way and whenever I pick up my brush that buzz of excitement of being able to share what I have created enables my heart to sing and my spirit to soar with each and every new painting. I can climb mountains, I can achieve great things, I can cross bridges. Maybe small ones at first though! Life is good and I believe. "If you can believe all things are possible to him who believeth- Mark 9:23"
First wash of a favourite scene. My scenes of Venice are being asked for now constantly purely because of the image on the cover of my book. 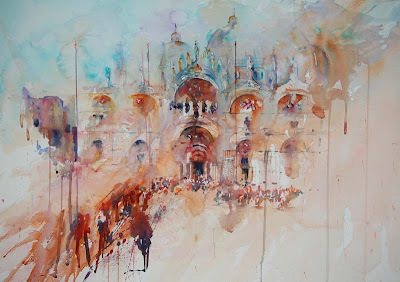 I visited Venice for the very first time on a very special Wedding Anniversary.The trip came as a complete surprise as I had longed to go there for a very long time to admire the inspirational location for many a masterpiece in the history of art. I walked around completely enthralled seeing sight after sight that to this day still thrills me and my hand when I try to capture those moments in watercolour. 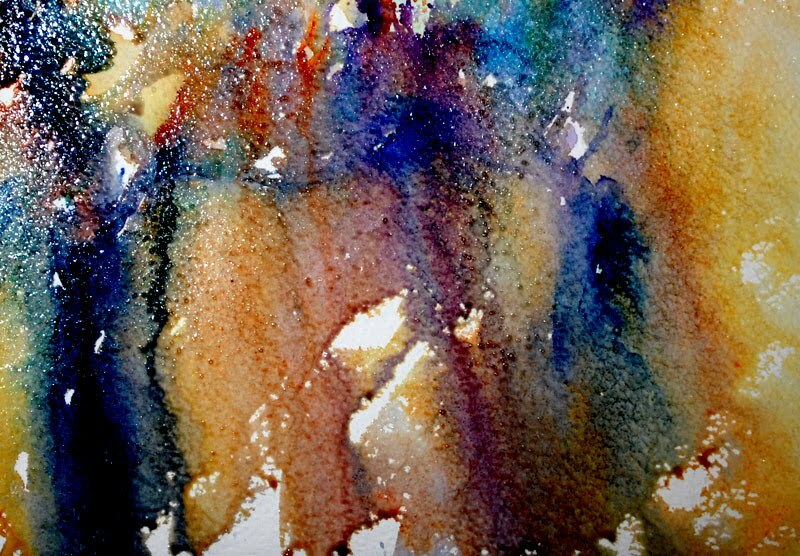 This morning with a full sheet of paper on my easel I worked on a glorious landscape in hues of vibrant gold aiming for an effect of days gone by. Reminiscent of a time when ladies wore beautiful Venetian costume. Possibly the characters I envisage would be wearing masks on their way to a grand Venetian Ball. My imagination is taking me to a time yet alone a place when all was beautiful and truly romantic. Even the stone statues seem to be telling a story of days gone by. If only they could talk.What tales they could tell..
Statues appearing magically above the golden arches of the facade. I cannot wait to finish this painting but I will savour each brushstroke and hold back from racing to the end of this delightful journey into a memory of yesteryear. 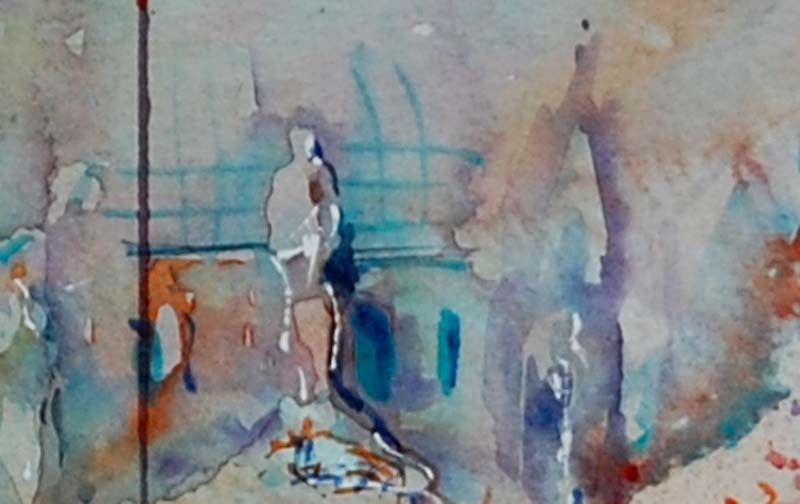 Section of a Study for an original painting of Venice. This morning I am quietly painting in my studio working on my next book and new collections for Autumn exhibitions.With the excitement of my book launch at the Mall Galleries last week and the wonderful art events I have been involved with it has been difficult for me to find quality time recently to do what I love most of all and that is to paint. Now I have that time my enthusiasm has never been higher. I have a really exciting body of work building up that will be on show soon. I look at all these new "treasures" and look back to how I started painting years ago and how I have changed and grown as an artist. I first started painting in an illustrative style with many botanical flowers. All captured in perfect detail with delightfully clean fresh colours. As time went by I found this form of working didn't suit my personality. It felt too tight and restrictive. So I then became engrossed in painting traditional landscapes. These were all connected with the English countryside I had grwon up surrounded by. Idyllic country scenes with tracks leading through fields or lanes leading the eye into the distance. Quaint cottages or village scenes would call to my brushes with the colour of foliage on the trees changing with the seasons. After a while these too didn't seem to make my heart sing whilst I worked. At that time I felt as though I was merely going through the motions of attempting to be an artist. As if I was just one of a large number of creators rather than being unique in my own right. It was only when I moved to Asia and then Dubai that my artists soul really started to develop. In England for years I had been watching watercolourists capture skies in a variety of hues that covered mainly blue or grey. In Dubai I saw skies alive with vibrant shades of golds and reds. In Asia I saw old buildings against new especially in Hong Kong. I adored how the edges of walls were often far from perfectly straight in the many ancient buildings I witnessed whilst travelling around Europe and my time living in France helped me see scenes that really were wonderfully exciting that had been painted many times by masters who lived long before my time on this wonderful earth. My landscapes sold well and favourites soon disappeared but my journey in watercolour kept leading me to even more exciting exploration into what my favourite medium could or couldn't do. I had and still have a thirst for all that is new and thrilling. It isn't surprising that these experiments have led me away from the more traditional and classical way of painting. Even so my brushwork and final detail are often hints of my previous years of training. I couldn't achieve the results I am gaining today without all the time spent studying in my past. I smile when I hear a surprised expression of "I didn't know you painted landscapes!". Amongst many other subjects I will aim to capture a beautiful scene and when I do paint landscapes I love them. But I believe variety is the spice of life and as mine is so colourful every single day brings me new joy . I may return to an "old friend" like a favourite landscape or scene from Venice. Or I will walk into my studio and go off at a completely different tangent with something completely out of the ordinary. Like blue sheep! A memory just came into my mind of an elderly lady who lived in the village where I grew up in Wales. I was very young and already creating in a variety of ways. They said "How wonderful, you never know what Jean is going to do next do you but it's always something beautiful!" She was old,frail and lonely after her husband had passed away so my visits or small bouquets of wild flowers to her never went amiss. I like to think she saw more in my childs innocent handful of white daisies or golden buttercups as I did. A simple beauty that brought a beaming smile. I was fasinated in colours even then. I always have been. One thing I am sure of. I will never be bored or tired of working in watercolour. I still always see the beauty in life. There is so much to see and capture. On top of this there are so many ways to capture everything in art. So many styles, colours and techniques. I am so grateful for being born with an artists eyes. I cannot for the life of me imagine missing all I see daily around me. And I am so very grateful for the gift of sight. I may be painting landscapes today but tomorrow? Who knows! I am true to what they said about me as a child to the adult I am now. "Expect the unexpected with Jean"
.........and I love life this way! How can my life possibly get any better after the whirlwind of a year I have had so far. Exhibitions, Private Previews, meeting wonderful artists and celebrities continually and my book launch at the Mall Galleries last week. I feel as though I am flying on the wings of happiness at times but today is the start of a brand new week and I have no idea where it is going to take me. My second book is a new adventure and I am already taking the first thrilling steps into that exciting avenue. I have a meeting tomorrow where I need to present a new collection of paintings and quietly behind the scenes I have been working on my second book. I learned so much from writing my first one that I now feel I have grown as an artist with far more experience in my technique which I am eager to share. I am as always fascinated with colour. The vibrance I am searching for in new ways with fascinating texture is really motivating me to paint daily enjoying every second I am holding my brush. So for my next exhibitions I am bringing a really exciting body of work together that thrills me by effects and leaves so much more for my own imagination to play with. "Standing Out in the Crowd"
Donating a painting from my first book to raise funds for Mcmillan Cancer Support. What a week! 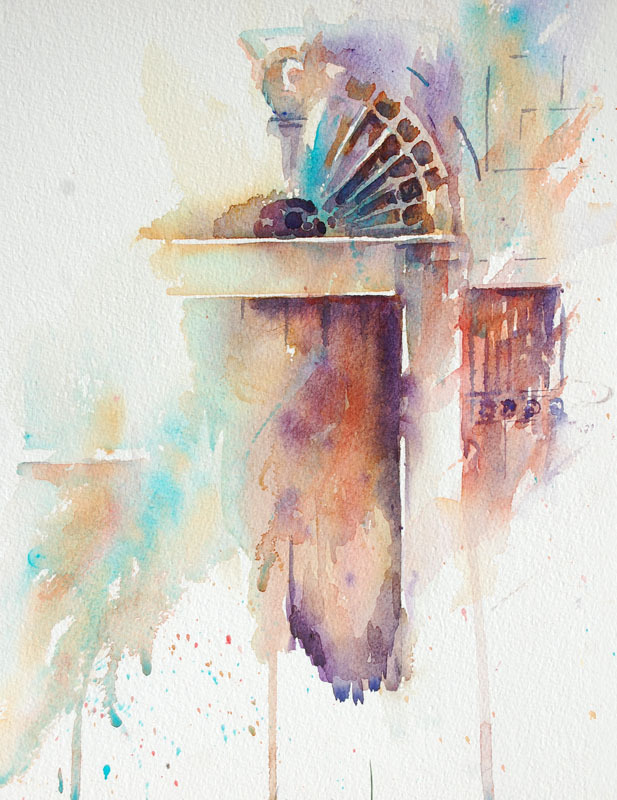 I faced last Monday with a successful meeting with an art agent.Then came Wednesday which saw the launch of my first book " How to Paint Colour and Light in Watercolour" at the Mall Galleries in London. 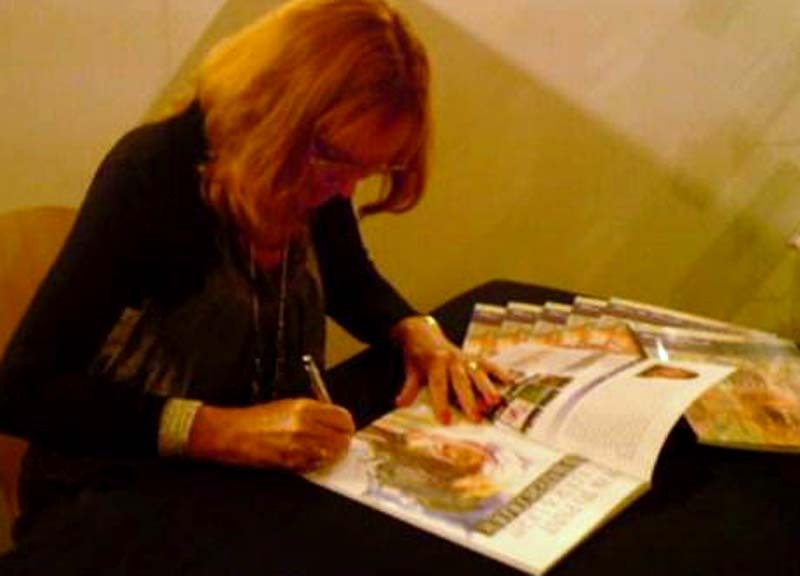 This was such a memorable day in that I demonstrated during the book signing whilst the SWA Society for Women Artists exhibition was running. I was thrilled to see red dots appear on my paintings in the exhibition but at the same time I know I loved the pieces I submitted and found it hard to part with them. Then on Friday I was at the " Meet the Artists" event in Kent organized by my amazing publishers , Search Press. I never seem to be in one place for too long at the moment! So by this weekend I was feeling really as though the last few days had surely been a beautiful dream with so many fantastic events happening one after the other. Surely these were enough for one small artist to enjoy in a period of just a few days. But last night was the end to a perfect week by meeting the perfect gentleman. I was invited for press coverage to be with Sir Micheal Parkinson who was the compere for a charity event in aid of Mcmillan Cancer support. I have donated a painting every year for the last few events because in my own way felt I was supporting a charity that does so much for all who are effected by the "word" many of us dread to hear. My week has been unbelievable and I am hoping to find time to write next week hopefully when I should with any luck be back in my studio rather than racing around to meet wonderful friends,colleagues and associates. Goodness, I wonder what I will be doing next! Watch this space and see! So much is happening recently that I am finding it very hard to keep up and share all my good news on my blog but I was thrilled to be chosen as " Author of the Month by Search Press this month. I have seen my first book with an amazing book launch at the prestigious Mall Galleries in London, had a fabulous day meeting fantastic authors at the " Meet the Artists" event and on top of this I had an interview for the Search Press Author of the Month feature! You can read my interview via this link and it probably gives a better insight into my personality and life. 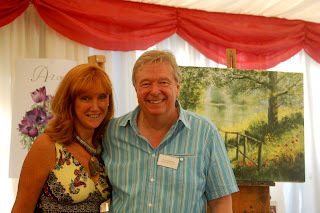 With Terry Harrison at the Search Press " Meet The Artists " event yesterday. You may think after an exciting few weeks with the SWA Society of Women Artists exhibition and my book launch for " How to Paint Colour and Light in Watercolour" at the Mall Galleries in London I would now be back to painting in my studio and working but no! Yesterday I made my way to a " Meet the Artists " event arranged by my publishers and it was a fantastic occasion. Celebrating years of successful publishing with a variety of versatile and talented authors Search Press really did create a brilliant day to remember. Many artists were invited out of which there were ongoing demonstrations during the day. I happily agreed to the invitation to demonstrate and share my techniques.To meet well known authors who have far more experience than I in the literary world was wonderful. Sharing a glass of champagne in sunshine is always a lovely way to spend a summer day but having the treat of watching others paint in all mediums and in so many styles really was a feast for this artists eye. To mention artists I enjoyed in one post on my blog seems unfair as their names could get lost so I am going to add separate entries of some of the paintings and demonstrations I enjoyed during the day. . It does feel strange being surrounded by artists whose names I have heard of for so long and now being a part of their world. Strange but very wonderful. I left with numerous promises to get in touch with agents,artists,galleries and many more exciting contacts. My future becomes more thrilling with every single day that passes but now I am even more enthusiastic to work on my second book which really is going to be full of surprises. Search Press really are an amazing company and I am so thrilled to be under their wings.
" 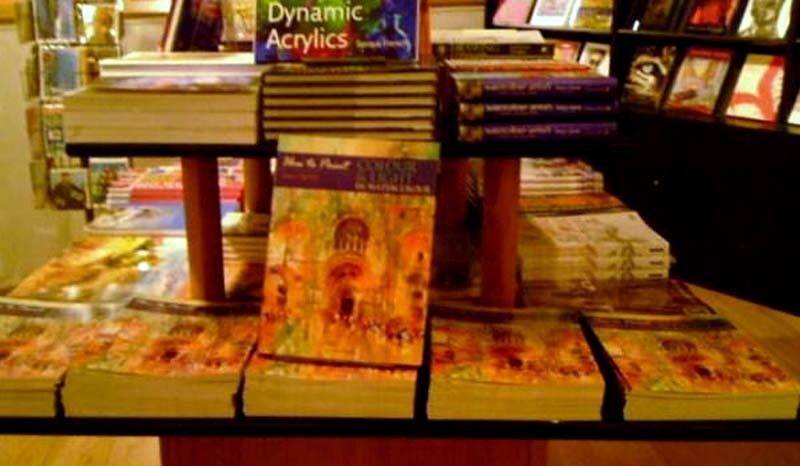 How to Paint Colour and Light in Watercolour" on display at the Mall Galleries in London yesterday at the book launch. It is now available to purchase at the gallery. Incredible! Yesterday seems like a blur as it was such a fabulous day which will be a very special memory for the rest of my life. I left home after the usual dilema for many females.What to wear for a book launch! But as my time has been so limited this week this meant racing for a train and hoping for the best! I talked to several friends yesterday on my way to the Mall Galleries, each wishing me luck and telling me everything would be wonderful. It probably hit me at around nine that this was really happening and not a dream. I arrived at the Mall Galleries early so that I could set up my art equipment ready for my demonstrations that day. Everyone there was so warm, encouraging and friendly. It felt very much like my usual workshop sessions and I quietly painted before the doors opened to the public to get a feel for my painting space. Next I moved towards the gallery reception to see where I would be signing my books and stopped in my tracks. There in full view at the front of all the books on show by so many leading artists worldwide was my own book on watercolour. In a fantastic row on full display. I can't begin to describe how I felt. I adore the Mall Galleries and have visited so many exhibitions there over the years including being in several with my own watercolours. But this was my first time of being included as an author. Of all the locations in the world for a book launch this has to be one of the most prestigious venues. The SWA,Society for Women Artists Annual Exhibition was on and as a member this was the reason behind my being there for my demonstrations. The doors opened and people started to arrive. It is amazing how many people visit the Mall Galleries on a daily basis. For me seeing many friends faces in the crowd was the icing on the cake. Each time I turned around another familiar smile faced me. I am so touched by how genuinely happy for me so many of those who know me obviously were. I am so grateful for wonderful friends and colleagues. And on top of this people who had never heard of me before kept coming up to tell me how much they loved my style. Asking where I had been hiding for so long! It was so wonderful to hear all the incredible feedback.
" This is exactly how watercolour should be " one visitor told me when looking at my paintings. I am overwhelmed by the number of positively glowing comments I have received in this vein. 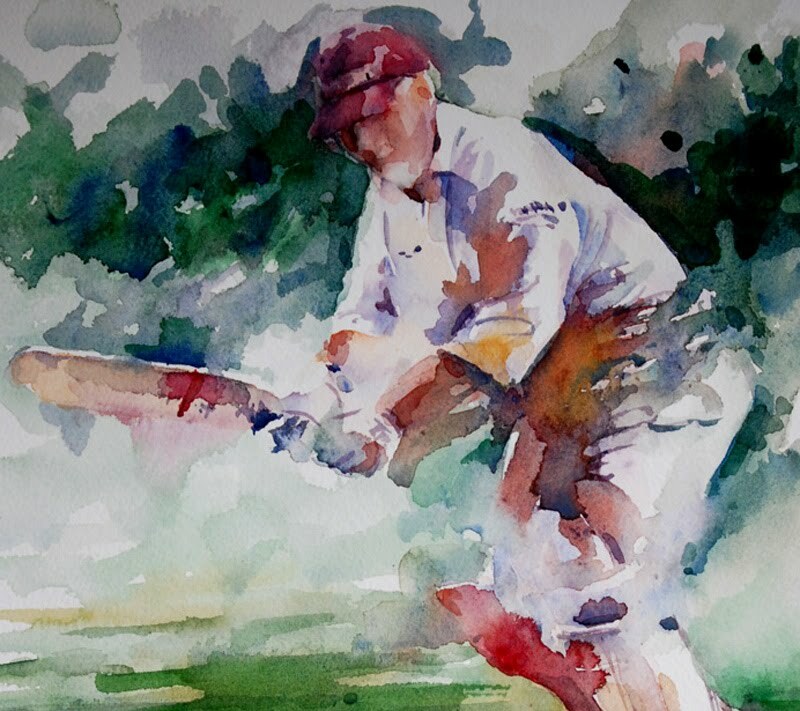 It seems many people want to see pure watercolour. 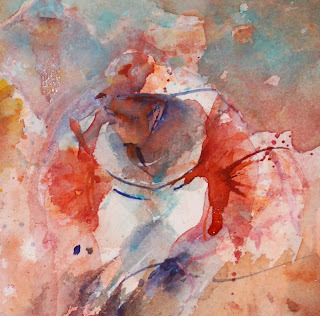 Used as a flowing and transparent medium that is truly only genuine pure watercolour rather than simply products that are used with the addition of water to create paintings. I understand as acrylics and water based oils are included in many top watercolour societies and exhibtions classed as watercolours. But the way I work obviously was thrilling to many who miss seeing the medium shining alone in all its glory. It was also thrilling and exciting to hear peoples reactions to how I always work without a preliminary sketch. And fascinating to watch facial expressions when subjects magically appeared on blank pieces of white paper or as I literally threw colour at the paper as I often do. Although I must admit with the highly polished wooden floor at the gallery I was very much on my best behaviour. I threw with caution so I think anyone who has been to my workshops may have thought I was quite " tame " for me yesterday. And I was! My demonstrations flowed with my joyous mood as I was so happily feeling confident because I had my favourite brushes in my hand. In my heart I knew I would be fine. When you hold workshops as often as I do and demonstrate regularly this really becomes a huge part of your art life that you enjoy. Sharing your passion for painting with others who are as enthusiastic as yourself. I held two demonstrations yesterday. One in the morning and one in the afternoon. 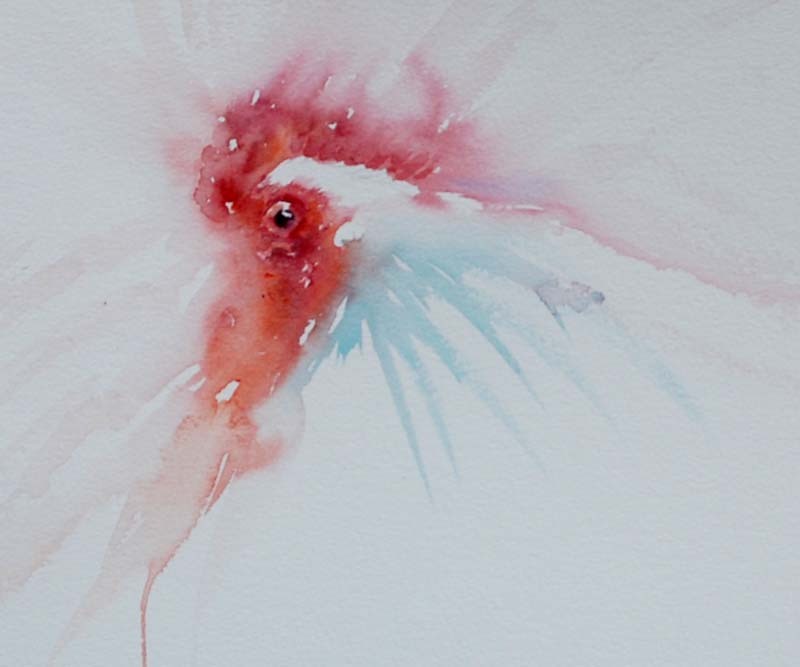 Cockerels are always a favourite subject so I started with a lovely beady eye for each character and moved away from my starting point bringing in movement and excitement via colour, directional brushstrokes and water effects. What is so fantastic this morning is knowing anyone who has read sections of my book already will now know exactly what I mean when I discuss my favourite techniques. 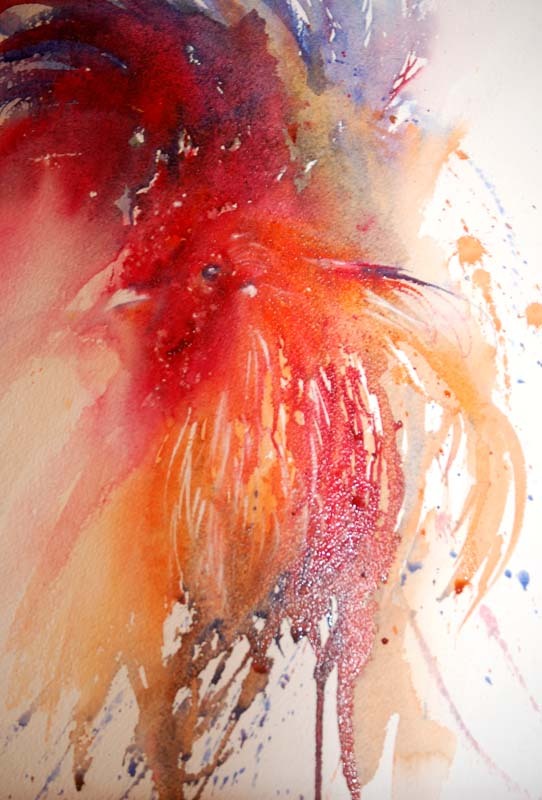 Here is the cockerel study from the early morning demonstration yesterday before the main group of visitors arrived. Cockerel Demonstratiuon from the Mall Galleries in London during my book launch there yesterday. Following the demonstrations and until the gallery closed I signed copies of my book. This felt so very unreal. I have seen so many authors in so many locations but yesterday I found myself signing my very first books that had been launched that morning. It felt incredible,amazing and very wonderful. I loved everyone I met and am so grateful to the friends who made a journey to be there on my special day. I will never forget a single moment of my book launch and am also very grateful to Search Press for being there all day yesterday to oversee my launch into life as an author. No author could ask for a better or more professional publisher. I have so much to be grateful for and so many to thank. Most of all I am aware that belonging to such a prestigious society as the SWA,Society of Women Artists has opened doors for me in a way that I could never have imagined even only twelve months ago. One thing I believe we all need to remember as artists is that it is our work that gets us accepted and recognised. As with any career we need to work hard on our skills and paint to our best ability if we wish to succeed. But it is always the wonderful people around us who can help us and guide us in our journeys if we listen and learn. And when we do see our dreams come true then it is time to help others. That makes the world a far better place. For me a dream has become reality I have my own journey with roads ahead of me still to explore but this will never keep me from helping anyone who needs a helping hand to reaching where they want to be or seeing their own dreams come true. Because I want everyone to feel as happy as I felt yesterday and feel today. Signing copies of my first book " How to Paint Colour and Light in Watercolour " at the Mall Galleries in London yesterday during the book launch. Book Launch: One Day to Go! Three Days To Go To the Book Launch! Behind the Scenes at an Exhibition.